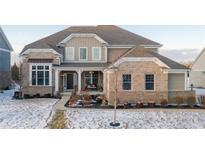 Below you can view all the homes for sale in the Calumet Farms subdivision located in Fishers Indiana. Listings in Calumet Farms are updated daily from data we receive from the Indianapolis multiple listing service. To learn more about any of these homes or to receive custom notifications when a new property is listed for sale in Calumet Farms, give us a call at 317-987-2530. Easy access to Shopping, Golf and the Geist Reservoir. MLS#21630981. RE/MAX Ability Plus. Finished basement & 3 car heated garage - you truly can have it all! MLS#21622892. Keller Williams Indpls Metro N.
All this just minutes to Geist Reservoir plus schools and shopping! MLS#21626384. Flat Fee Realty, LLC. Enjoy the incredible finished basement for entertaining guest w/ 5th bedroom, full bathroom, kitchen/bar area with granite counters, stainless steel appliances and video wall entertainment area. MLS#21624176. Keller Williams Indpls Metro N.
Convenient to schools, shopping and entertainment! MLS#21623069. eXp Realty, LLC. Custom Window Coverings Stay. Tankless water heater. MLS#21617093. Keller Williams Indy Metro NE. All This In Fishers' Hottest New Neighborhood, Brooks Park W/ Community Pool, Clubhouse, Playground & More. Don'T Miss! MLS#21613841. Keller Williams Indy Metro NE. 3 car attached garage, hardwoods, built-in bookshelves & more! HSE Schools! MLS#21614275. Leo Signature Realty. All This In Fishers' Hottest New Neighborhood, Brooks Park W/ Community Pool, Clubhouse, Playground & More. Don'T Miss! MLS#21613842. Keller Williams Indy Metro NE. Flex room for Dining or Office, Main Level Master Suite w/ Luxurious Spa Like bathroom, Four Generously Sized Bedrooms Upstairs with walk In Closets, Loft Area, Huge Unfinished Bonus room, The Finished Lower Level Features Wet Bar, Family room, Sixth bedroom & Full bath,& Tons of Storage Space, Spacious Backyard w/ Patio, Irrigation System, Oversized 3 Car Garage, w/ 11 x 7 Storage Area, Community Pool, Play Area, & Basketball Court MLS#21599511. RE/MAX Legends Group. So many great extras and features that you must see. MLS#21577519. Paradigm Realty Solutions.